The Arnold family migrated from Germany to Winnipeg, Canada where they manufactured tombstones and architectural cut stone. They then migrated to the United States and started Arnold Stone Brick and Tile Company of Jacksonville, Florida and then to Greensboro, North Carolina where they established the Arnold Stone Company in 1932. Arnold Wilbert Corporation is the successor to Arnold Vault Company in eastern North Carolina. It became a separate corporation in 1947. Arnold Vault Company was the 17th licensee of Wilbert W. Haase Company, Wilbert, Inc.
Arnold Wilbert’s main offices and manufacturing facility are located in Goldsboro, NC with a warehouse and service operations in Wilmington, NC. The offices in Goldsboro were built in the early 70s and the crematory was added in 1990. In 1996, we added 2500 sq. ft. dedicated to the education and training of our Funeral Professionals. Shortly after, we increased our production facility by 5000 sq. ft. All told, there are 65 employees in the Carolinas operations plus management. With its’ many facets of operation, Arnold Wilbert is a leading burial vault, cremation urn product, and burial and cremation services supplier in Eastern North Carolina. In 2003, Arnold Wilbert purchased Charleston Wilbert (which has 10 employees) in Summerville, SC, and in 2005 the company became a Redi-Rock dealer for eastern North Carolina and South Carolina. The company continually looks at acquisitions and mergers that will help grow its core business and add value to its customer relationships. Wilbert, Inc.’s roots go back to the 1880’s with the L.G. Haase Manufacturing Company, which produced concrete products including cemetery markers. It sold its first concrete burial vault in the Chicago area in 1913. In 1928 experimental work began on an asphalt lined burial vault. In 1929 the firm of Wilbert W. Haase Co. was established for the purpose of manufacturing patented asphalt lined burial vaults under the WILBERT trademark. Exclusive territories were sold under license agreements with the Haase Company. The licensees collectively purchased all Mr. Haase’s interest in his company in the middle 1940’s and changed the name of the company to Wilbert, Inc. in the mid 1960’s. There are currently over 200 Wilbert Licensees with over 300 outlets in North America. 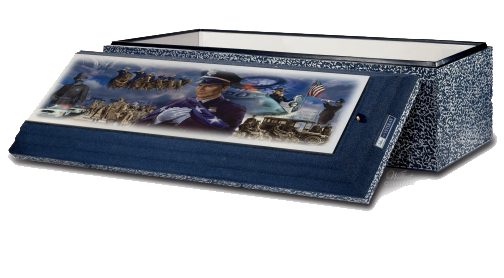 Arnold-Wilbert offers burial vaults and cremation urn products to the following counties in North Carolina: Beaufort, Bertie, Brunswick, Carteret, Craven, Cumberland, Duplin, Edgecombe, Franklin, Greene, Halifax, Harnett, Hertford, Hyde, Johnston, Jones, Lenoir, Nash, Martin, Pamlico, Pitt, New Hanover, Northampton, Onslow, Pender, Sampson, Tyrrell, Vance, Wake, Warren, Washington, Wayne, and Wilson..
Arnold Wilbert offers two types of burial set ups, Wilbert Way (WW) and Ovation, and Above Ground with Lowering Device (AL). Both set ups consists of an above ground seal and a lowering device, also known as The Wilbert Way Lowering Device. The difference in the two set ups is in the placement of the vault and the vault cover during the funeral service. The Lowering Device and Greens setup includes graveside grass and casket lowering device. A 15x20 tent is available to be set up by our staff at the gravesite for funeral services. The tents cover the burial area and provide a comfortable place for families to gather during the funeral. Ten chairs are provided for each definite tent. Arnold Wilbert provides disinterment services. If it becomes necessary to move a burial vault from one location to another, Wilbert can assist with the disinterment service. We handle everything from locating the burial vault to relocating the burial vault to a new location. Vault Transfer is a service available between Wilbert licensees and dealers. Arnold Wilbert uses the vault transfer service when a burial request has been made outside of the licensee territory. The location of the cemetery is needed to determine the appropriate Wilbert licensee or dealer. Since the services offered by each Wilbert licensee vary, the licensee work together on a per burial basis to determine the services, such as tents, grass, and chairs that each licensee will provide for the burial. Wilbert Funeral Service in Chicago (corporate HQ) has awarded Arnold Wilbert with "Ultimate Service Provider" for the tenth year in a row. There are four service levels: Minimum Service, Basic Service, Premium Service, and Ultimate Service Provider. To be classified as an Ultimate Service Provider, one must receive at least 75 points out of 88 points; a higher score is attainable when bonus points are earned for exceptional achievements. Points are collected by category, including tents, chairs, greens, Wilbert Way, lowering device, vaults, employees, and trucks and delivery. Arnold Wilbert surpassed the 75 points needed to obtain Ultimate Service Provider. Although we are proud of this accomplishment internally, it pleases us most that local families are the recipients of this service.